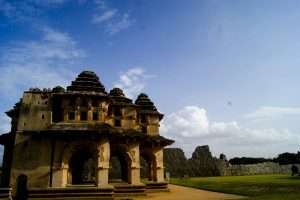 India Someday is here to give you great advice on what things to do in Hampi, an archaic city that exists outside of time. 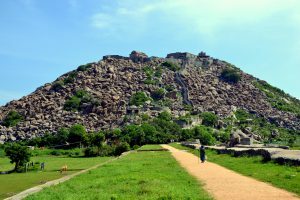 Plan your trip with us and we can organise an itinerary for you and answer any questions you have on how to reach Hampi. Hampi is a miracle! Carpets of rice paddy and endless banana groves rise up out of dust and boulders, fed by the swollen Tungabhadra River. 14th century temples populated by monkeys and dusty sunshine look down on a game of twilit cricket. Ornately carved pagodas attract worshipers from the country, though the local population is shadowed by the tourist community. Sprawling, cheap cottage-style hostels, with great pizza and Tibetan thukpa, make it a haven for backpackers and families looking to spend quality time together. Come for the knowledge, stay for the peace. – Boulder climbing. It’s an exciting sport, and you’re sure to find fellow backpackers who’ll show you the ropes. Asking yourself how to reach Hampi? The easiest routes are to go from Goa or Bangalore. If travelling from Goa to Hampi then catch a train or a bus, there are no flights that reach here. For train we recommend the Howrah Express from Vasco De Gama Station at 7:20 am to arrive in Hospet. If you are taking a bus then this will take about 7 to 8 hours. Our favourite to use is Paulo Travels. For more information on this route click here. 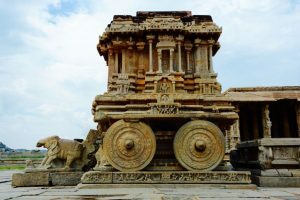 How to reach Hampi from Bangalore? You should take a bus for the cheapest option and this will take roughly 8 hours. Or you can take a train from Bangalore railway station to Hospet. The Hampi express goes every day at 21:10 pm.